Date read: 4/17/17. Recommendation: 10/10. This took me months to read because there's so much to it. Perhaps the most detailed, convincing book I've ever read. 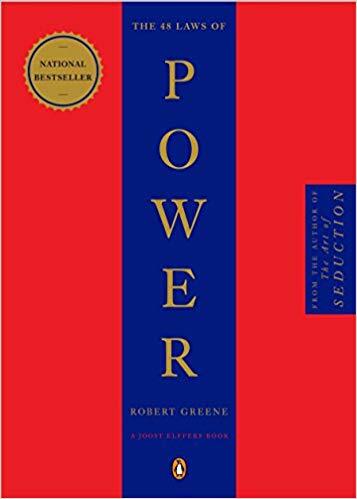 Greene sets forth the individual laws of power and offers countless historical examples of each in practice. Not a book you're going to finish over the weekend, but a very important book and investment. Greene makes the argument that it's not a question of ethics, the game of power is inescapable, even in our daily lives. We might as well learn the game and master the laws of power so we're more aware, less distracted, and better able to negotiate situations in our favor. If the game of power is inescapable, better to be an artist than a denier or a bungler. An emotional response to a situation is the single greatest barrier to power. Emotions cloud reason, and if you cannot see the situation clearly, you cannot prepare for and respond to it with any degree of control. Deception is a developed art of civilization and the most potent weapon in the game of power. Patience in all things is your crucial shield. Impatience is a principal impediment to power. Hide your intentions not by closing up (with the risk of appearing secretive, and making people suspicious) but by talking endlessly about your desires and goals–just not your real ones. You will kill three birds with one stone: You appear friendly, open, and trusting; you conceal your intentions, and you send your rivals on time-consuming wild good chases. When you make the other person come to you, he wears himself out, wasting his energy on the trip...also create the illusion that he is controlling the situation. Words have that insidious ability to be interpreted according to the other person's mood and insecurities...Action and demonstration are much more powerful and meaningful. You can die from someone else's misery - emotional states are as infectious as diseases. You may feel you are helping the drowning man but you are only precipitating your own disaster. The unfortunate sometimes draw misfortunate on themselves; they will also draw it on you. Associate with the happy and fortunate instead. The answer lies in judging people on the effects they have on the world and not on the reasons they give for their problems. Self-interest is the lever that will move people. Once you make them see how you can in some way meet their needs or advance their cause, their resistance to your requests fro help will magically fall away. At each step on the way to acquiring power, you must train yourself to think your way inside the other person's mind, to see their needs and interests, to get rid of the screen of your own feelings that obscure the truth. Master this art and there will be limits to what you can accomplish. We forget a lot in our lives, but we rarely forget an insult...There is nothing to be gained by insulting a person unnecessarily. The satisfaction is meager compared to the danger than someday he or she will be in a position to hurt you. Slowness to pick up your weapons can be a weapon itself, especially if you let other people exhaust themselves fighting, then take advantage of their exhaustion. That is what holding back from the fray allow you: time to position yourself to take advantage of the situation once one side starts to lose. In the forest, one shrub latches on to another, entangling its neighbor with its thorns, the thicket slowly extending its impenetrable domain. Only what keeps its distance and stands apart can grow and rise above the thicket. Do not accept the roles that society foists on you. Re-create yourself by forging a new identity. The world wants to assign you a role in life. And once you accept that role you are doomed. Your power is limited to the tiny amount allotted to the role you have selected or have been forced to assume. An actor, on the other hand, plays many roles...forge a new identity, one of your own making, one that has had no boundaries assigned to it by an envious and resentful world. If boldness is not natural, neither is timidity. It is an acquired habit, picked up out of a desire to avoid conflict. David and Goliath Strategy: By choosing a great opponent, you create the appearance of greatness. If you make a show of going against the times, flaunting your unconventional ideas and unorthodox ways, people will think that you only want attention and that you look down upon them. It is an old but powerful trick: You pretend to disagree with dangerous ideas, but in the course of your disagreement you give those ideas expression and exposure. You seem to conform to the prevailing orthodoxy, but those who know will understand the irony involved. You are protected. Wise and clever people learn early on that they can display conventional behavior and mouth conventional ideas without having to believe in them. The powerful learn early to protect their most valuable resources: independence and room to maneuver. By paying the full price, they keep themselves free of dangerous entanglements and worries. Powerful people judge everything by what it costs, not just in money but in time, dignity, and peace of mind. And this is exactly what Bargain Demons cannot do. Wasting valuable time digging for bargains, they worry endlessly about what they could have gotten elsewhere for a little less. Set a goal, and when you reach it, stop.